San Diego researchers were the first to participate in the new model of conservation. The giant pandas born at the San Diego Zoo have helped to produce 22 additional giant pandas in China. The giant panda is still on the endangered species list but is less threatened than when the program began. Their fuzzy faces are endearing. Watching them chomp on bamboo or bask in the sunshine is downright captivating. For many – locals and out-of-towners alike – a visit to the San Diego Zoo is not complete without seeing the giant pandas. The San Diego Zoo’s successful 23-year giant panda conservation program is coming to an end and the beloved bears are being repatriated to China. The two giant pandas that live at the San Diego Zoo – 27-year-old Bai Yun and her son, 6-year-old Xiao Liwu, will leave the facility on April 29. So, before then, panda enthusiasts may find that a visit to the San Diego Zoo is worth the trip. The San Diego Zoo announced that its last two remaining giant pandas will head to China. NBC 7's Melissa Adan has more on why they have to go. From the zoo’s entrance, there are several ways to get to Panda Canyon and Panda Trek, where the bears live. Grab a zoo map at a kiosk located just past the entrance and pick your path. Like birds? The Aviary Trail, if you follow the signs, will get you there. The Monkey Trail will get you there, too, with views of monkeys, hippos, and gorillas along the way. You could also ride the Alaska Airlines Skyfari East across the park, exit at the Skyfari West station and follow Park Way to get to the pandas. Whichever way you choose, wear comfortable shoes, as the zoo terrain, at times, can be a bit steep. You do have to trek to get to Panda Trek, but if a glimpse of the pandas is your mission, you’ll find it’s worth it. Once you get to the panda zone, make a beeline for the viewing line. This past Sunday, the wait to see Bai Yun and Xiao Liwu was about an hour long, but the path is shaded, with pretty landscaping, informative plaques, and plenty of photo opportunities. Once you get through a bit of the line, zoo staffers will take several photos of you against a green screen. On that green screen, your wildest panda dreams will come true: the zoo’s computers will superimpose the adorable bears onto the backdrop of your photos. Cup your hands in front of you and, like magic, a tiny panda will appear in your hands in your photograph. Signs around the Panda Shop in Panda Canyon at the San Diego Zoo offer 10 percent off giant panda merchandise. Once you make it to the habitat, you’ll have a chance to gaze at a panda and snap a few photos. A zoo staffer will share fun facts about the bears. If you’re lucky, you’ll lock eyes with one of the pandas – probably while they’re in mid-chew, since snacking on bamboo is their highest priority – and you will understand why people love the species and why they mean so much to San Diego. This past weekend, the San Diego Zoo launched the “farewell tour” for the pandas, a three-week celebration of the animals before they depart. Outside their enclosure, throughout Panda Canyon, you’ll spot signs of the imminent goodbye. In the panda-themed gift shops just outside the Panda Trek, there are signs that read “Giant Panda Celebration Sale,” offering 10 percent off any giant panda merchandise purchase. “Your support has helped make a difference for this much-loved species,” some of the signs read. The San Diego Zoo is encouraging patrons to share their memories and hopes for the giant pandas on social media, too, using the hashtag, #pandas4ever. The Giant Panda Friendship Wall can be found near the elevators in Panda Canyon. You can hang a free tag on it with your wishes for the giant pandas. Over by the elevators off Park Way, there’s an installation called the “Giant Panda Friendship Wall.” Patrons can buy a little bell at the gift shop to hang on that wall, with proceeds going toward panda conservation efforts. The bells for sale at the Panda Shop. San Diego Zoo Global and China have been collaborating on panda research and conservation of the species since 1996. The departure of the giant pandas marks the end of that program but, as the zoo said earlier this month, "the beginning of a new era of panda conservation at the San Diego Zoo." The facility is working with their colleagues in China to determine what those future plans may entail and if, someday, the pandas might return. Visitors are invited to hang tags on the Giant Panda Friendship Wall. This past weekend, Chinese Ambassador Zhang Ping of the People’s Republic of China Los Angeles Consulate toured the panda habitat alongside zoo leaders. He told NBC 7 that, on every level, the agreement between China and the San Diego Zoo has been a model of success. 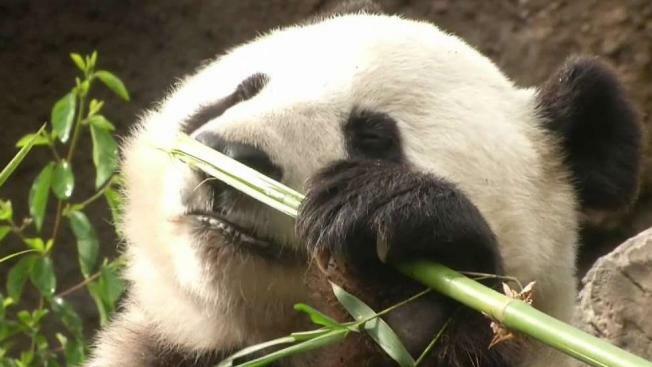 "They've done a very good job in panda research and conservation, so I think this is a very good thing for continuation of the program in the future," Zhang told NBC 7. Bai Yun and her son are the last two giant pandas to live at the San Diego Zoo, one of only a few zoos where giant pandas can be found in the United States. The zoo’s giant panda conservation program began more than two decades ago when the species was threatened with extinction. The San Diego Zoo's work with Bai Yun and her cubs has helped to boost the wild population of pandas in China to more than 2,000, according to the zoo. In October 2018, Bai Yun's longtime mate, Gao Gao, was returned to the Chinese Center for Research and Conservation for the Giant Panda. The father of five cubs born at the San Diego Zoo, Gao Gao had been living at the zoo for 15 years as part of the long-term loan agreement with the People’s Republic of China. That signaled the beginning of major moves for San Diego's panda family. The zoo said the departure of Bai Yun and Xiao Liwu was not unexpected, as the zoo's long-term conservation agreement with China was due to end. 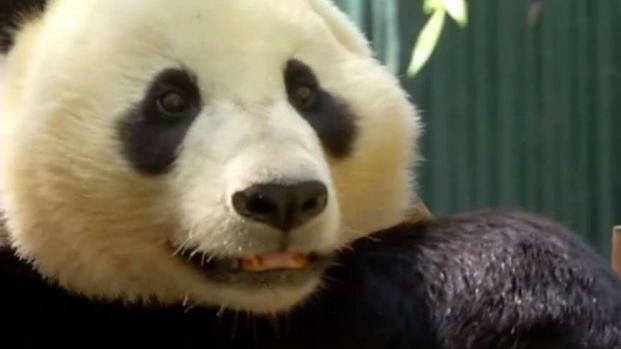 "Although we are sad to see these pandas go, we have great hopes for the future," Shawn Dixon, chief operating officer for San Diego Zoo Global said last month in a statement released to the media. The zoo plans to keep the panda enclosures intact, ready for a possible return someday because, in San Diego, if you're a panda, the door is always open. And, as you leave the zoo's panda enclosure for the final time, you may feel a tiny lump in your throat. As a San Diegan, I know I did. For the past few years, as a mother of two little girls, our family has spent countless days at the zoo. Often times, those trips begin with a first-thing-in-the-morning visit to see the pandas. There, my 4-year-old likes to imagine how the pandas may have slept overnight, what they ate for breakfast, how they'll spend the rest of their day. She eagerly asks her baby sister for her opinion on the topics; baby sister smiles in return. And those memories, for me — sweet panda faces and the delight they’ve brought to my own curious cubs — are conserved in my mind forever.